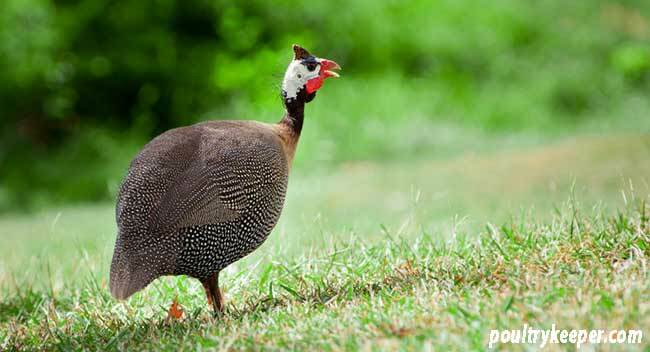 The domesticated Guinea fowl has kept much of its wild nature and many poultry keepers with a little bit of space are keeping Guinea fowl in their back garden. They are great at removing bugs from the garden and don’t scratch the ground like chickens so don’t make as much of a mess, but care should be taken on where they are kept because they can be noisy at times with their calling and can disturb close neighbours. 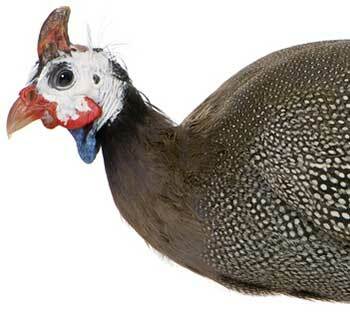 Guinea fowl originate from West Africa and can still be seen in the wild in Africa to this day. There is evidence of them arriving in Europe during the 16th century when they were popular as table birds and were prized for their rich tasting eggs. Guinea fowl are experts at flying and can fly almost vertically upwards when they want to. They prefer to perch in trees if they can and I’ve had many failed attempts at catching mine. There have been times where they have spent a night perched on the roof of our house or garage rather than going into the chicken house! A wing can be clipped to stop them flying but Guinea fowl do need a reasonable area in which to roam so a large run or free range of the garden is usually best for them to be happy. Guineas are good watchdogs and will start to become very vocal if something unusual comes into their environment. They are always alert and very watchful and get used to their owners and family but if there’s a predator or stranger nearby, they will start to create a lot of noise, making a good alarm system. Keeping Guinea fowl is certainly a bit different and with care, you can gradually introduce them into the same run used by your chickens. The main concern is making sure they are roosting somewhere safe. If you can provide a hen-house with a high roosting area they will certainly use this but if you have trees nearby be careful they don’t end up free-range roosting! Keeping Guinea fowl is fun but they can disturb neighbours and roost where it isn’t safe. We have just one category for articles on keeping Guinea fowl at the moment but as time goes on, we will add some more. This section contains general articles about keeping Guinea fowl. From our beginners guide to advice on housing and feeding, this is the place to learn about keeping Guinea fowl at home or on your smallholding.